At last, a full (opensource!) 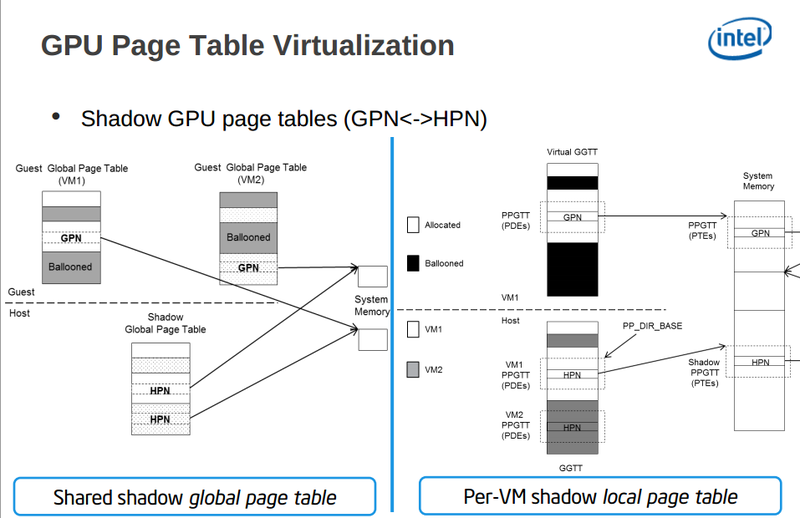 GPU virtualization solution that allows virtualized guest operating systems to “own” a shared Intel GPU yet allows applications to run with near-native performance! This means games, both DRM and free media, plus OpenCL applications can run in separate guest operating systems on a single Intel GPU system (convenient for users) or in a shared cloud environment (a nice feature that can be offered by cloud providers). This is an Intel-only GPU solution. 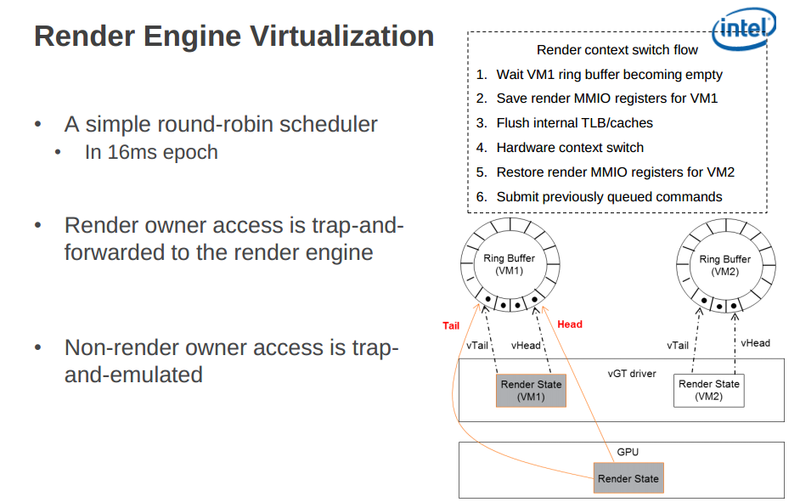 For more about other – non-Intel – GPU virtualization solutions, see our popular TechEnablement article, “MultiOS Gaming CUDA & OpenCL Via a Virtual Machine“. XenGT provides near native GPU performance. 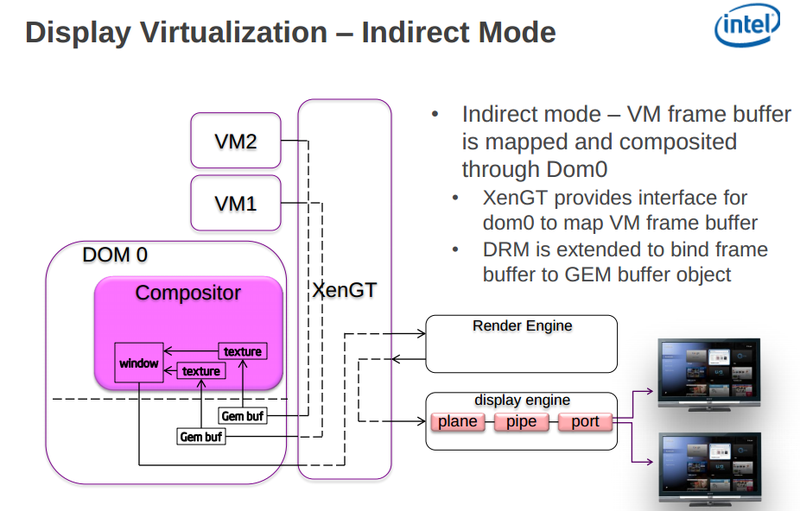 The Intel gVirt project is an opensource dual GPL/BSD license project currently based on Xen (hence the codename of XenGT) that has also been marketed by Intel as GVT-g. We are told a KVM implementation will be forthcoming. Citrix is also bringing support to this technology to their Xen ClientEnterprise product. Mediated pass-through that achieves both good performance and scalability, and also secure isolation among guests. The Intel® GVT-g stub that extends the Xen vMMU module to selectively trap or pass-through guest access of certain GPU resources. 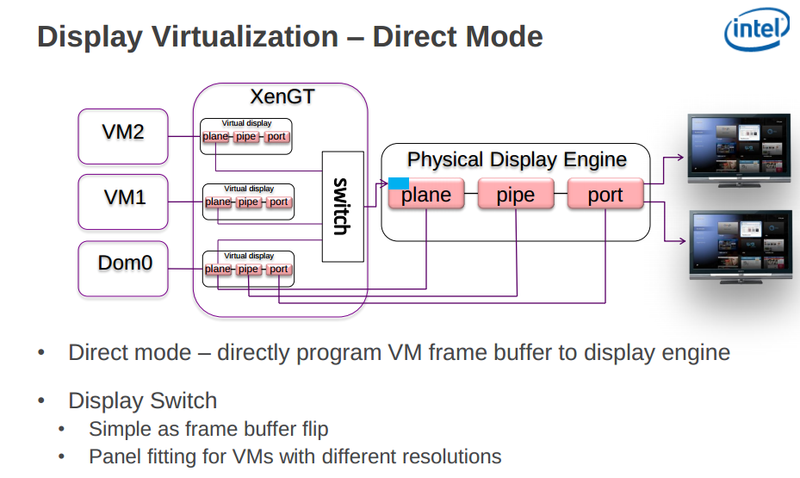 Traditional Xen supports only pass-through or trap of the entire I/O resource of a device. All the trapped accesses are forwarded to the mediator (see sharing discussion below) for emulation. The mediator uses hypercalls to access the physical GPU. Address space ballooning eliminates virtual graphics address translation overhead through address ballooning by ensuring that the guest OS view of global graphics memory space is exactly the same as (but restricted to a fraction of) the host view. 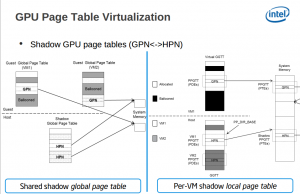 Succinctly, Intel® GVT-g exposes the partitioning information to the VM graphics driver through the VM_info MMIO window. 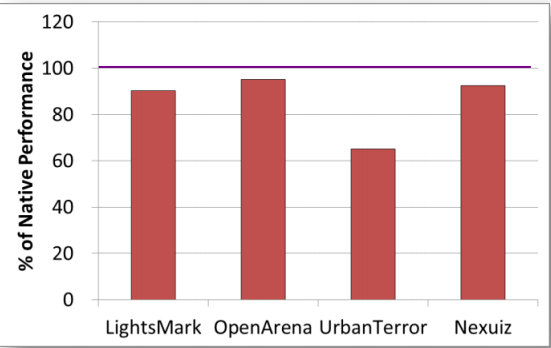 The graphics driver marks VMs’ regions as ‘ballooned’ and reserves them from its graphics memory allocator. Thus the physical addresses in the guest OS can be directly used by the hardware. Graphics address space ballooning is different from traditional memory ballooning techniques: Memory ballooning is for memory usage control and is focussed on the number of ballooned pages, while address space ballooning marks special memory address ranges. The combined GVT-g stub and address space ballooning means that Intel® GVT-g can run the native graphics driver inside a VM with direct access to performance-critical resources. Privileged operations are emulated by the mediator (shown in the first image) by trap-and-emulation. The Intel® GVT-g mediator is the manager for all the guest vGPUs and is also responsible for scheduling of vGPU operations. (Currently round-robin scheduling is utilized.) 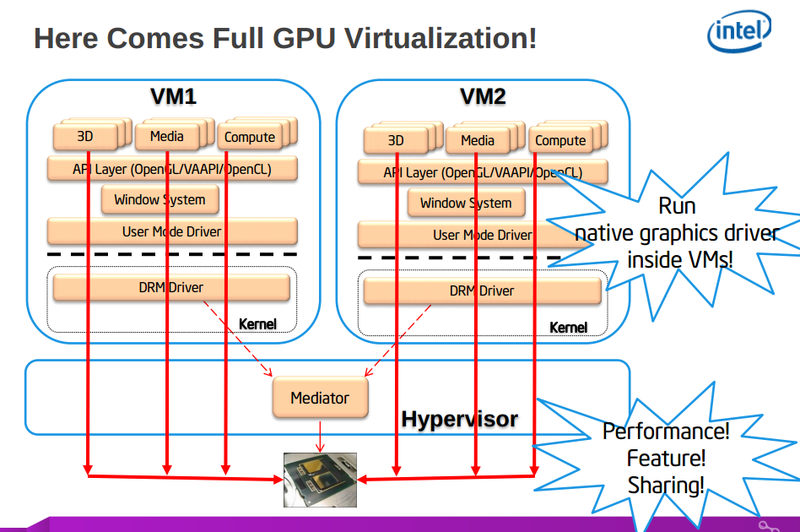 The mediator handles the physical GPU interrupts including the generation of a virtual interrupt to the designated VMs. A VM is prohibited from mapping unauthorized graphics memory pages. All the GPU registers and commands programmed by a VM are validated to only contain authorized graphics memory addresses. The GVT-g design addresses denial-of-service attacks, where a VM might deliberately (or mistakenly) trigger lots of GPU hangs. Following is a video from the Xen project on XenGT.